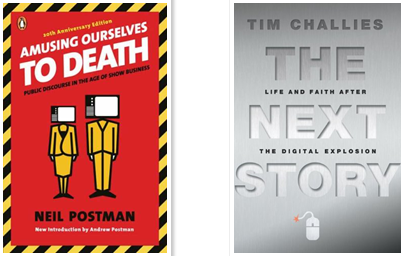 I want to commend two books to you: Amusing Ourselves to Death by Neil Postman and The Next Story by Tim Challies. Both are tremendous in helping understand where we have come from in terms of media and communication and the transition to our digital world of information overload, endless entertainment, and constantly mediated communication. For no medium is excessively dangerous if its users understand what its dangers are. 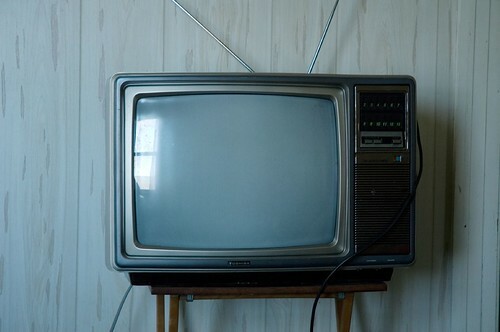 Written in 1985, Postman is primarily concerned with the effect of television and the transition from an oral to a written to an image based culture. The first half of the book is about the concept of a medium and the written and literate culture of early America while the second half delves into his concerns with the medium of television. Postman reintroduces a concept from Marshall McLuhan that the medium is the message or metaphor. What is meant is that the medium (book, television, cell phone, blog) has a built in message itself. A book exudes a permanence and inherent form of logical discourage. 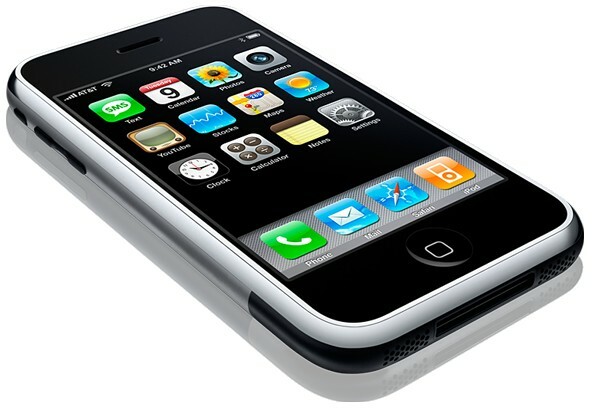 The cell phone was made so that businessmen could be accessed at all time while travelling – something that should tell you what is inherent to its message. Postman’s discussion of the literacy and level of discourse of early America is fascinating, including his description of 8 hour debates between Lincoln and Douglas, and the popularity of certain books reaching the pervasiveness as the Super Bowl. In the second half of the book, Postman digs into how television has impacted the areas of news, religion, politics, and education. Each of these chapters is incredibly prophetic. It’s amazing that this book was written over 25 years ago before the age of the internet. While mediation is a necessity in this sinful world, it is a concession. We are grateful that God gives us the Son and the Holy Spirit as mediators so we can pray to him, worship him, and receive his blessings. But we still long for that broken fellowship to be fully restored. In this life, while mediation is good, we know that the spiritual intimacy we long for—the direct presence of God—will be so much better. Challies’ book builds on Postman’s work and others and then brings in a solid Biblical worldview to attempt to sort through the insanity of life in this digital age. He is very comprehensive discussing everything from cell phones to Wikipedia to social media and email and does a remarkable job of bringing God’s Word to bear on it all while discussing the real temptations and struggles we face. Avatar tells us that the soul is superior to the body, that while the body is necessarily corrupt, polluted by its dependence on matter, the soul is pure. And in this way it calls us back to Gnosticism, a controversial religion that triggered the warning lights of the very earliest Christians. Chapter 5 was the most revolutionary and helpful chapter for me. He discusses the “mediators” we use in communication and how we can start to diminish the importance of face to face time and use more mediation (such as email instead of a phone call) the more uncomfortable the conversation looks to be. However, it’s his connection between Gnosticism and avatars that blew me away. I think it’s dead on – as we live more of our life through social media and avatars, we diminish the physical as less and less meaningful. We complicate rather than simplify. As you consider reducing your sources of information, consider nontechnical solutions. Consider moving backward instead of forward. I could go on about both of these books. Both are well worth your time. Think about all your devices, the amount of information you take in daily, the amount of communication you engage in now, and the imagery you are pounded with. Postman and Challies have given us some help in all of the deluge.